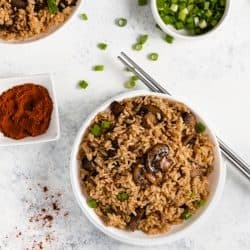 This Instant Pot Brown Rice is pressured cooked in a beef and chicken broth combination and tossed with sauteed mushrooms and diced green onions. This is the most flavorful and perfectly cooked rice you’ll ever make! –Perfectly cooked rice every time: The Instant Pot takes the guessing work out of cooking rice. 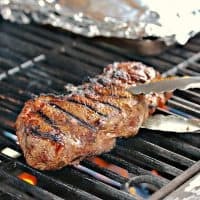 It’s always perfectly cooked and with the timer set, I don’t have to worry about checking on it, which frees me up to cook the rest of my meal. –Meal Prep: I can make 8 servings at a time in my 6 quart Instant Pot, which allows me to freeze the leftovers for future meals. 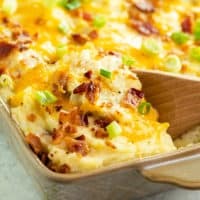 I freeze them in portion-sized foil packets and pop them into a 350 degree oven for 20 minutes when I want to use them. 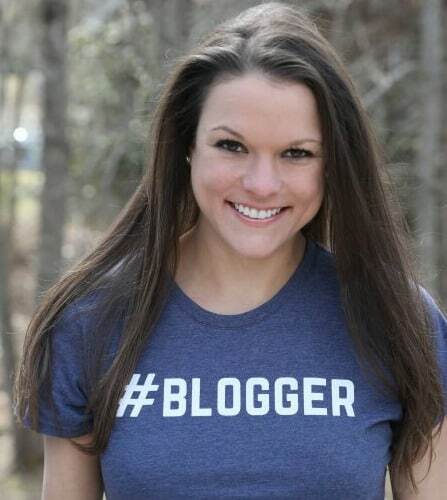 It’s a huge convenience and time-saver. 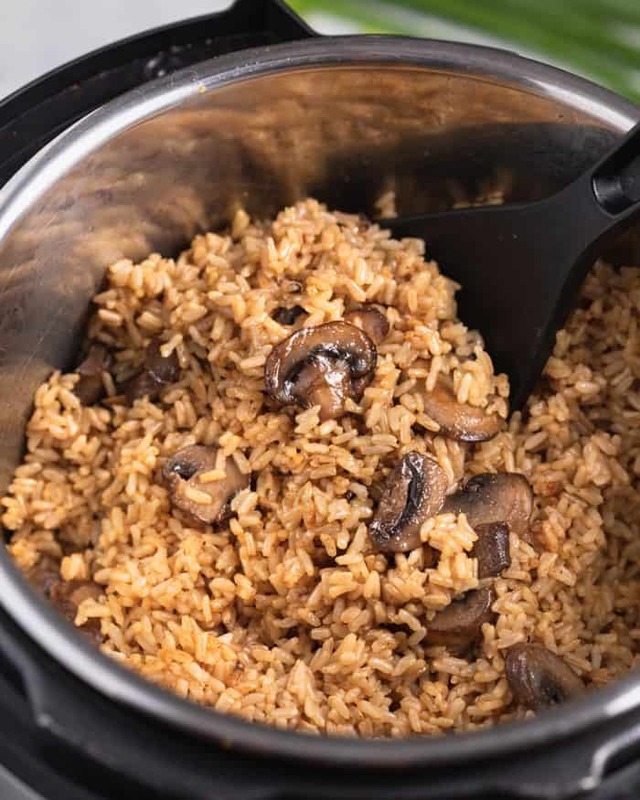 –Enhanced Flavor: I find that the flavor of the rice is super enhanced when it’s pressure cooked in the Instant Pot with beef and/or chicken broth. An added bonus is sauteing mushrooms in the pot first, and using the broth to deglaze it after. 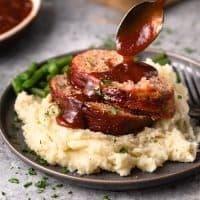 –Higher nutritional value, flavor, and texture: Not only does Instant rice lose some of its nutritional value during the process of cooking it and drying it out again, but it loses a lot of flavor and texture. So while there is the benefit of being able to cook it faster, there are those sacrifices to consider in the process. 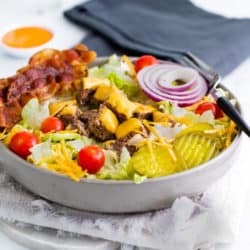 –This article dives deeper into the details as to why nutrition and flavor are compromised, and I have to agree with their point of view on this. When you compare one to the other, there really is no question. Instant rice is nothing compared to the real stuff. It’s almost not even worth eating unless you have to. 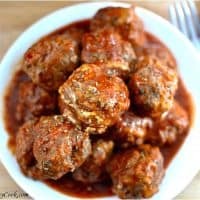 What Size Instant Pot did I use? 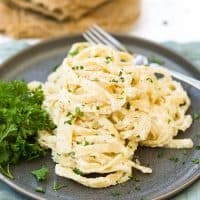 -I used my trusty 6-quart Instant Pot for this recipe, which is what I recommend for most families, and is what most Instant Pot recipes are based on. It can cook enough food for a family of four and won’t take as long to come to pressure as an 8 quart will. 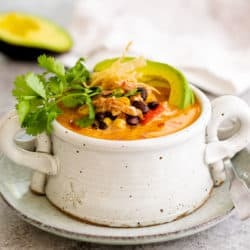 -Yes, this recipe can easily be double in a 6 quart Instant Pot (or larger) to make 16 servings, which is the amount of rice in the photo above. How Much Does 1 Cup of Uncooked Brown Rice Make? -Each cup of uncooked brown rice makes about 3 cups of cooked rice. 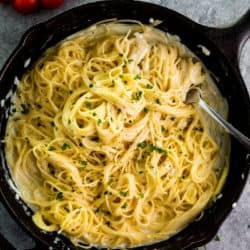 This recipe makes enough for 8 people at 3/4 cup per person. 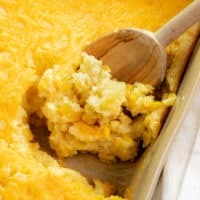 -Cooked rice will last up to a week in the fridge, you can have sides for days! -Yes! It’s a convenience that makes the process of making ‘real’ rice, as opposed to Instant rice, worth it. Not a speck of it has to go to waste. Note: It’s best not to freeze the green onions along with it. What if the Burn Indicator Turns on During Pressure Cooking? -The more I use the Instant Pot, the more I see this message. As I kn long as I’ve made sure that I’ve removed any specs from the bottom of the pan before pressure cooking, I don’t worry about the message as it will go away with a little bit of time. 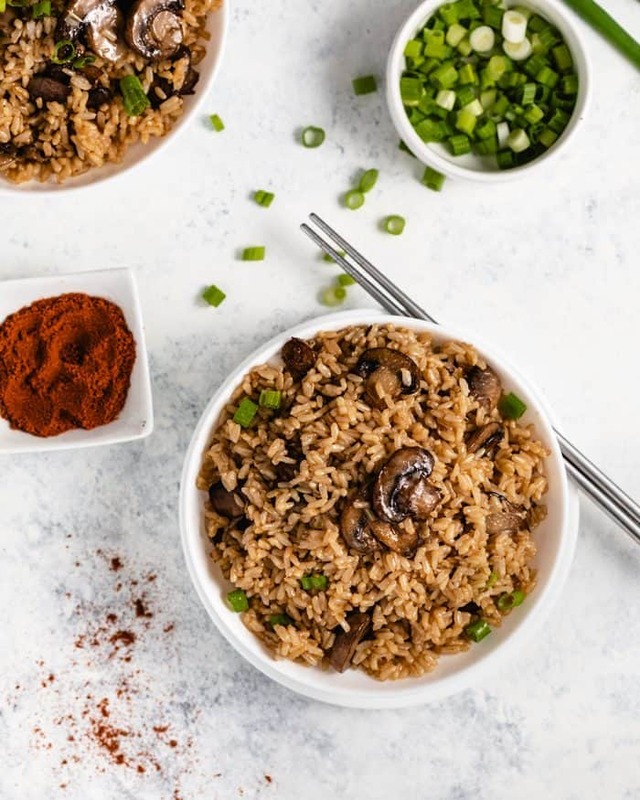 This Instant Pot Brown Rice is pressured cooked in a beef and chicken broth combination and tossed with sauteed mushrooms and diced green onions. This is the most flavorful and perfectly cooked rice you'll ever make! 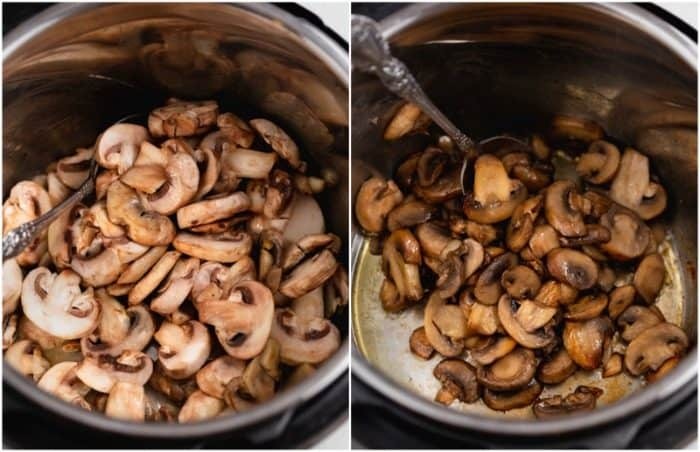 Set the Instant Pot to sauté and add the butter and mushrooms. Cook until the mushrooms have decreased in size and browned, about 6 minutes. Remove the mushrooms from the pan and keep the pot on Sautee mode. Add in the chicken broth and deglaze the pan but scraping up any brown bits left on the bottom of the pot. This will enhance the flavor of the rice but will also help to prevent the burn message from appearing during pressure cooking. Add the beef broth and the rice. Stir and cover the pot, ensuring the vent is sealed. Pressure cook for 22 minutes, (or 24 minutes for higher altitudes). Let the pressure valve naturally release. After ten minutes, you can flip the valve to release any remaining pressure and open the lid. Stir the mushrooms back into the pot. Top with green onions and serve! 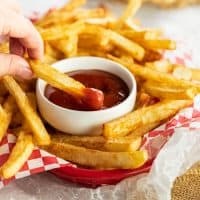 -Onions can be sautéed along with the mushrooms if desired. 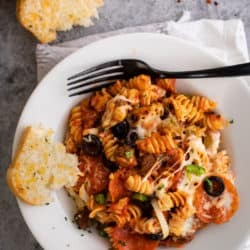 -This recipe can easily be doubled in a 6-quart Instant Pot (or larger) to make 8 servings. When doubling the rice recipe, is everything exactly doubled? Hi Caley, yes, everything else would doubled exactly! To make it easier, look at the top of the recipe card on the top left. You’ll see a box with the number of servings, 8. Hover over that box and you’ll see a slider which allows you to adjust the number of servings, which automatically adjusts the ingredient amounts. So in this case, slide it right up to 16! Enjoy! Just a note, though: you mention that we can double the recipe to make 8 servings, but when I loaded this page it was already pre-set to the 8 servings amounts! Might want to just mention the serving slider in the description so people don’t misunderstand what you’re considering the baseline. Hi Marty! Oh my gosh I totally messed that up!!! Thank you so much, I will update ASAP! You are the best! Honestly!